The pearl series of lunar-themed coins takes a different approach to the design of lunar themes, while still focusing on the given representative animal for each of the 12 birth years in the Zodiac. Today, the 2017 1 oz Proof Silver Fiji Pearl Rooster Coin is available to you online at Silver.com. Ships to you in beautiful, red packaging with a Certificate of Authenticity. Latest from the MDM Lunar Series! Mintage limited to 8,888 coins only! Face value of $10 (FJD) is fully backed by Fiji’s government. 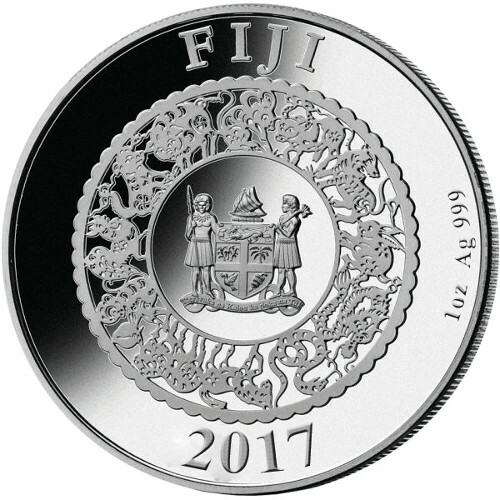 Obverse includes the seal of Fiji. 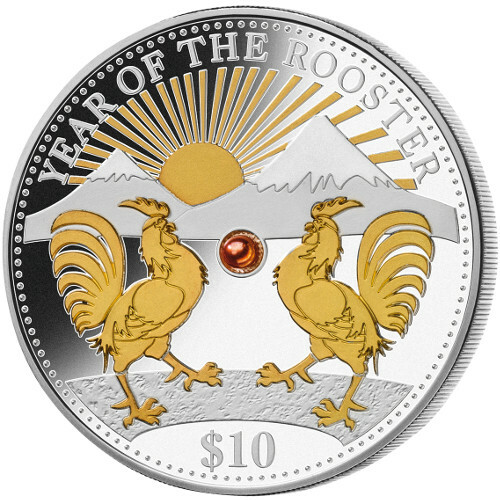 Reverse depicts the Year of the Rooster. Freshwater pearl insert with 24-karat gold plating! All coins in the Pearl Lunar Series of silver coins feature a few unique design elements that set them apart from other products. As the name suggests, there is the inclusion of a freshwater pearl that is set in the exact center of the reverse design field. Additionally, there is a 24-karat gold gilded finish on the primary designs in the silver Year of the Rooster design. Fiji is a beautiful island country in a region of the South Pacific Ocean known as Melanesia. The island nation consists of more than 330 small islands, with 110 permanently inhabited by people. The nation is more than 1,100 nautical miles from the northeastern shores of the North Island of New Zealand. On the reverse side of all 2017 1 oz Proof Silver Fiji Pearl Rooster Gilded Coins you’ll find the unique Year of the Rooster coin selected by the MDM mint and its artists. These silver coins include a pair of roosters facing each other, each with a single leg raised. In the background, snow-capped mountains rise toward the sky as the sun rises between the peaks. The obverse of the 2017 1 oz Proof Silver Fiji Pearl Rooster Gilded Coin you’ll notice the official emblem of the nation of Fiji. It is included along with engravings of the coin’s nation of issue, year of issue, purity, metal content, and weight. All 2017 1 oz Proof Silver Fiji Pearl Rooster Silver Coins listed here today ships to you inside of a beautiful red box, with the coin itself encapsulated for protection and an individually numbered Certificate of Authenticity set inside the lid. MDM is a German minting facility that produces a variety of commemorative bullion and proof coins for nations around the world. Please don’t hesitate to call Silver.com at 888-989-7223 with your questions. You can also connect with us online using our live chat and email features. You can even find the silver price per ounce right on our homepage each day!